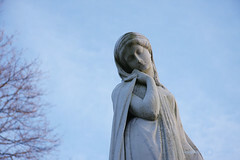 This photo is of a statue in a local cemetery. I plan on entering this next week in a local show where Magic and Mystery are the theme. Would love to hear your comments on whether you think it qualifies and how best to crop - should I remove the tree or leave it in. All constructive comments welcome and encouraged. Thanks! At first I thought it was Evangeline! Beautiful statue, I like it with the tree. I would bring her in closer so that we can better see her face. Will you be able to tell them where it was taken? Nice shot. Is the title a reference to the song by Christine Lavin? Well, I'm pretty sure it's the Virgin Mary. Nice shot, though. I'd keep the tree. Thanks, Cathy. It's a community event I've exhibited in in the past, s/b fun. Carol, thank you. It had to be taken in my own town, not sure they will know otherwise. Thanks, Jim, 3 for the tree! It could be the BVM, it is an RC cemetery. Thanks, Jenn, that makes 4. I appreciate all of your wonderful comments. Lovely image Judi. I'd crop the tree out to just behind her so she's off center. I think I'm out voted here, but I think it is distracting. Beautiful shadows and detail on the statue. I think she is strong enough to stand alone. Well, I turned in the photo to the exhibit on Friday morning, with the tree. Julie, I didn't see your response until today, but thank you so much. If I decide to list her on Etsy or RB, I'll consider tree removal and closer as Carol suggested. Thanks again, everyone, for your wonderful, thoughtful comments.